In 1837, a young girl barely 18 years old was crowned the queen of Great Britain. Her name was Victoria and the petite teenager would go on to reign for more than 63 years – a reign exceeded only by today’s current monarch, her great-great-granddaughter Queen Elizabeth II. To pay tribute to Victoria’s coronation, William Wyon, the Royal Mint’s official chief engraver at that time, designed a £5 gold coin depicting the young monarch. Issued in 1839, the coin was so beautiful that it has since been hailed as one of the most beautiful British coins ever struck. Now that same design is once again making waves in the numismatic world as the sixth issue in the famed British Pobjoy Mint’s popular Reverse Proof Series. Struck in one ounce of highly-pure 99.9% silver, the legal-tender coin features the same design that appeared on the original coin. It depicts Victoria as Princess Una from Edmund Spenser’s poem The Faerie Queen, a story which recounts the adventures of Princes Una after she was rescued by Saint George from the clutches of an evil dragon. The design represented the first time a British monarch had ever been depicted as a fictional character on a coin! The design shows “Una & the Lion,” a scene from the poem in which a ravenous lion is so overcome by the beauty of the princess that instead of devouring her, becomes her loyal servant and watches over her day and night. The design shows Queen Victoria as Princess Una walking to the left of a lion. The French phrase “DIEU ET MON DROIT” meaning God On My Right – the motto of the British Monarchy – is above the image while underneath are the Roman numerals MMXIX (2019). Struck as a reverse proof with frosted fields and mirrored raised devices, this $1 silver coin is a truly fitting addition to Pobjoy’s Reverse Proof Series. Just 50,000 will ever be struck, however, and with 2019 being the milestone 200th anniversary of Queen Victoria’s birth, you can bet demand for Victoria-related coins and collectibles will be in high demand! Click one – or several – to your cart today! SIXTH ISSUE IN POBJOY MINT’S REVERSE PROOF SERIES – The Pobjoy Mint’s Reverse Proof Series featuring popular designs from beautiful coins from the past add the Una & the Lion design to its ranks. William Wyon’s famous design from 1839 is recreated on this coin’s reverse while the obverse features the regal portrait of Queen Elizabeth II. STRUCK IN HIGHLY PURE SILVER – Each 2019 Una & Lion Silver Reverse Proof coin is struck in one ounce of highly-pure 99.9% fine silver. 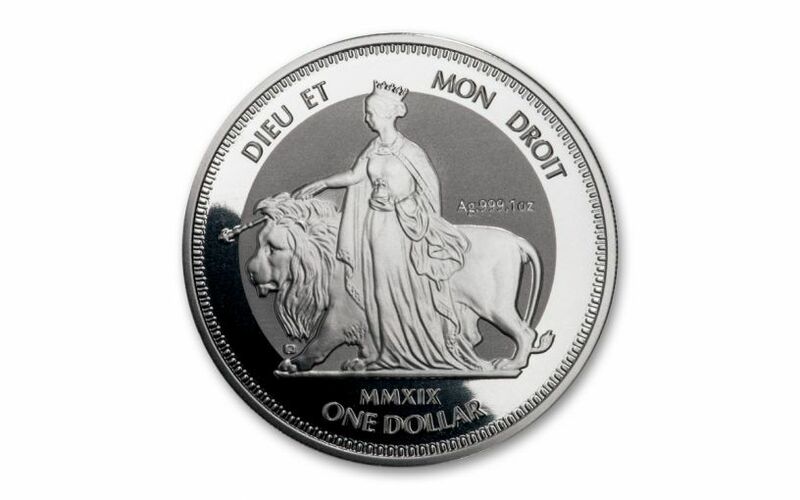 LEGAL TENDER COIN – These 2019 Una & Lion One-Ounce Silver Reverse Proofs are $1 legal tender in the British Virgin Islands. LOW LIMITED EDITION – The maximum worldwide limited edition for this 2019 Una & Lion One-Ounce Silver Reverse Proof has been set at just 50,000. 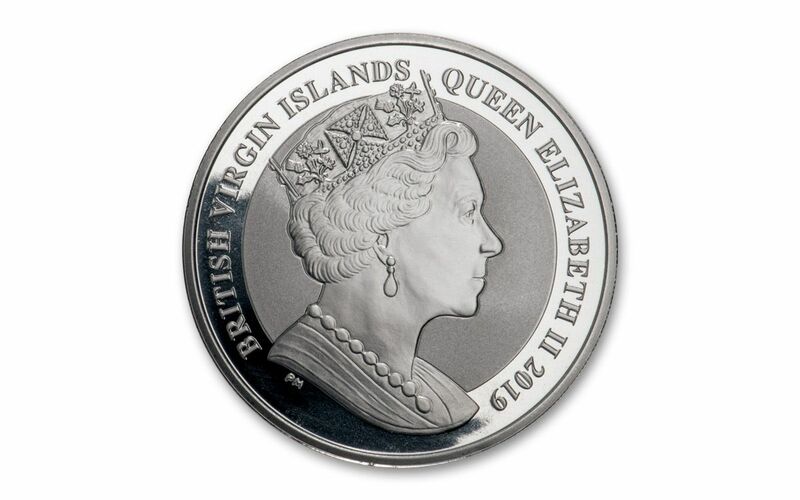 Celebrate Queen Victoria’s 200th birthday with the 2019 $1 British Virgin Islands Una & Lion One-Ounce Silver Reverse Proof. It’s one of the world’s most beautiful coin designs captured in pure silver! It’s fantastic!